To wear smokey eyes whenever I damn well please! — and not just when it’s considered seasonally or otherwise appropriate (fall, winter and evenings out on the town). To never, ever withhold sensational smokey eye accouterments, like the $38 Hourglass Cosmetics Visionaire Duo in Prism, from my beauty brethren, and to always spread the gospel of smokey eye love and truth to the best of my abilities. Smokey eye ’til I die! 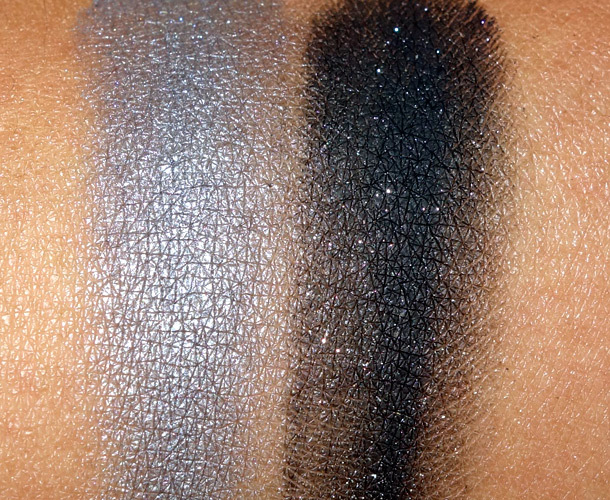 Imagine the darkest, deepest, truest black shadow that haunts your makeup dreams. Then make it smoother than Jeremy Renner singing in a smokey jazz bar, add powder grains that refuse fallout, and give it the cutest flecks of silvery blue glitter. And not just a lame sprinkling of glitter, but a perfect amount — just enough to wink at you without venturing into tween makeup territory. Oh, but it gets better. The other half of this duo rocks just as hard. It’s a shimmery slate, like a combination of periwinkle Crayola crayons and thunderstorm clouds, that buffs and blends into beautiful, smooth gradients. 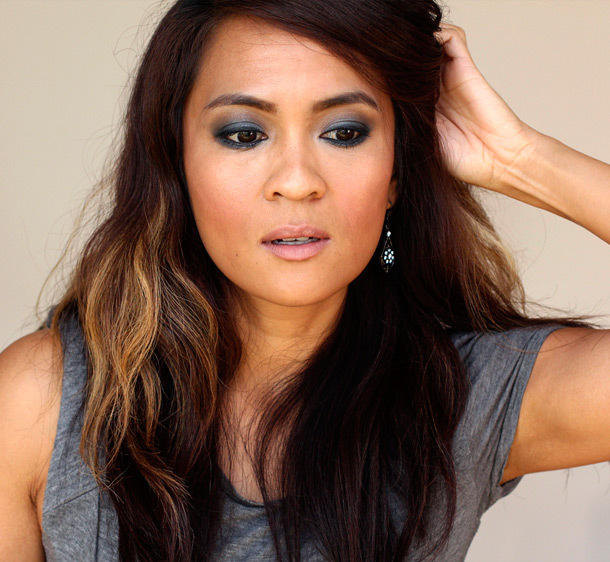 Neither color leans too cool nor warm, so this is truly one of those smokey eye duos that almost everyone can wear. I like to pat the black shade down as a base on my lids, buff out the edges lightly with a domed shadow brush, then layer the slate shade on top and merge everything together with a clean blending brush. I repeat the process along my lower lash lines, line my water lines and upper lash line with black liner, and finish with plenty of mascara. If I have some extra time, I’ll sweep a brown shade (or the bronzer/blush I might be wearing that day) into my crease. The long-running Unsung Heroes series features much-loved permanent collection products from a variety of bodacious beauty brands. I adore the way the end result works with my brown eyes, and I’m sure it would coax out the color of your eyes, too. Aaaaand there goes another one of those ideas I wish I’d thought of. Must have slipped right through my heavily hydrated paws (Lollia Handcreme baby!). Apparently, it’s a thing. And it’s blowing up on the New York food scene. The chef/inventor/mad genius behind the idea, Keizo Shimamoto, takes classic ramen noodles, shapes them into buns, and crisps them in a griddle. Then he sticks a burger with shoyu sauce and simple toppings inside. I’d so jump on that train if I could get a veggie version, OM NOM NOM! 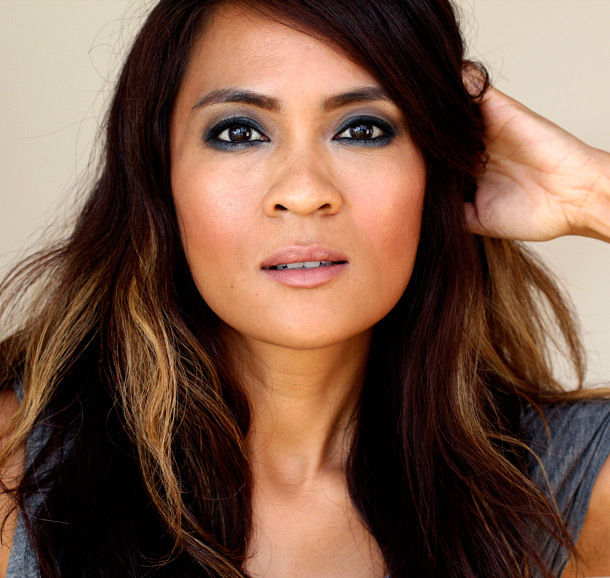 You rock that smoky eye anytime, anywhere girl! I did a taupey smoky eye yesterday (obsessed with Urban Decay’s Mushroom shadow). Oh, and I have to tell you that the 9 year old boy I take care of on Mondays is OBSESSED with Tabs! He gets here and runs to the computer first thing and says “let’s see Sunday with Tabs!” and then squeals with delight at the latest photos. Ooh, Mushroom is a great color. What did you wear it with? How sweet that your 9-year old charge hearts Mr. Tabs. 🙂 I will tell him that he has a new fan! I utilized my Smoked palette for the look. I put Freestyle on from lashline to brow, then applied Asphalt close to the lashline, blended Mushroom over that and up into the crease, and then lined with the Perversion pencil. So, when you get back from Hawaii you’ve GOT to get up here and go to the local mall with me. You’ve got to meet my favorite Urban Decay rep. He’s quite the makeup artist and an overall fun guy. So, about the latest Tabs fan, I’ve started calling him CCK — Crazy Cat Kid. He LOVES cats! So cute that he loves kitties so much! We need more kids out there like that. He’s a really special kid. Last week he wanted to paint my nails (LOVE THIS KID), and he chose the new green polish from Urban Decay since green is his favorite color and he thought the skull on the cap is “so cool!” He did a neater, cleaner job than I do. Not a drop of polish drifted to the cuticles! What a sweetheart. He sounds very artistically inclined! Maybe a makeup artist in training? I can totally see this kid being a makeup artist. The other day in the car on the way to Trader Joe’s (yes, he accompanies me to Trader Joe’s and helps me scope out all the cool vegetarian items, he loves to read the labels) he said “I really like how you do your makeup!” I tell ya, put a few decades on this kid and he’d be the perfect man! HOLY look at YOU!! So HAWWWWWT! Lady you’d have everybody wanting you to be their prison wife! 😉 Sorry, just finished Orange Is The New Black the other day haha! I love their eyeshadows! They are the BEST! HAHAHAHA, I looooove that show too! That is the prettiest smokey eye ever! I pretty much gave up on trying to master the look, and on black and grey shadow all together. But you made me want to try it again! I didnt realize you were supposed to start with the darker color as a base. That is what i get for trying to teach myself from palette how-to cards. thanks, karen! The colors are a tad too cool toned for me, but I would love to see the other shades in this line! WOW. That’s one seriously smoky eye, Karen — I love it. I haven’t done a blue OR silver smoky eye in months (months! ), and you’re kinda making me regret it. Ahhh Prism looks HOOOOT on you! I own 3 of these already, but Prism hasn’t become part of my collection yet! Now I really do want it! Holy moly! This looks AMAZING on you Karen! 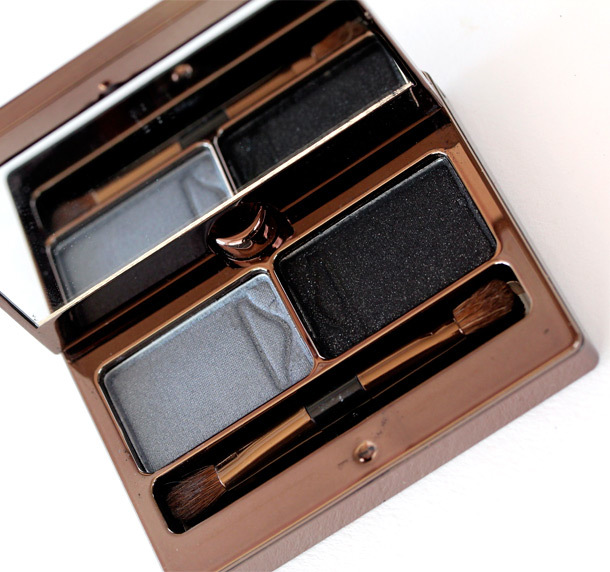 I love these Hourglass duos… I’m definitely going to have to check out this particular one though now! I absolutely love this smokey eye on you Karen! Taupe Smokey Eye looks regal as always! Ramen Burgers?! Hmmm. Gotta have that! First of all, it’s a testament to your descriptive writing skills that you always make me want to buy things I will never, ever use! 🙂 That black is gorgeous, though. Did I tell you about last Halloween when even my (then) 9 year old questioned my smokey eye skills? And I was making him up to be a zombie! HAHA! 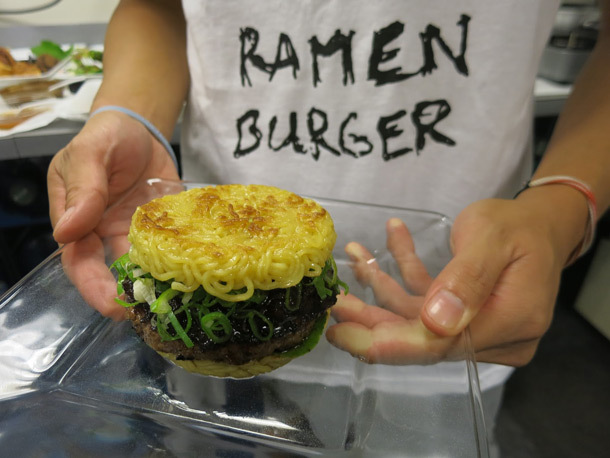 My heart seriously almost stopped when I saw that Ramen Burger. I was just saying yesterday that I don’t understand the interest in burgers on pretzel buns and that I would much prefer a standard bun. Now I have to take that back – I would be all over the ramen buns. LOVE how you’ve worn this – with the black e/s as the base. This is indeed a gorgeous combo and I really like the bluish undertone in the grey color. GORGEOUS! I couldn’t ever accomplish that look though!